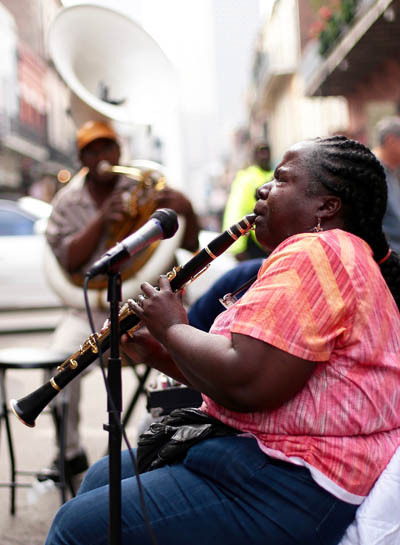 Around every corner, on streets closed to cars, serenading crowds from restaurant balconies, city squares, in clubs, pubs and even in a hat shop, New Orleans musicians are everywhere. I recently returned from a long-anticipated pilgrimage to the birthplace of jazz. With just seven nights to enjoy its spoils, we didn’t need to look far to find music. 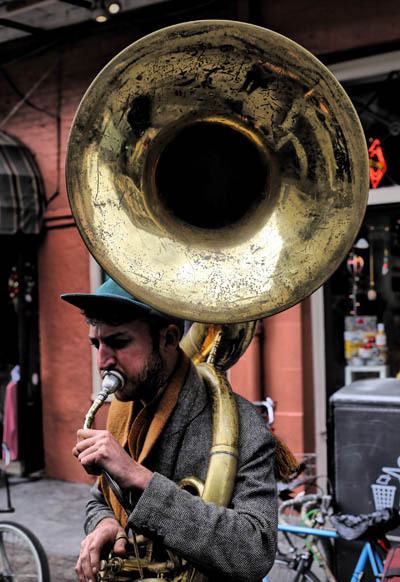 As I bopped, swayed, jiggled, clapped and whooped, something repeatedly struck me about being a New Orleans musician. The hustle was real and constant. And it was done joyfully, without shame. From the first band at the first pub, the singer made it clear that that the only way they were paid was through us, the crowd. There was no safety net. No leader or employer to hide behind. Just the music and your ability to hustle for tips. We saw groups ranging from the guitarist and singer in a dress and suspenders, with a tall skinny saxophonist who looked like Woody from Toy Story and a short saxophonist punk girl, to eight boys playing on a street corner mobbed by revelers, surrounded by chaos on Halloween. Not one band played their own agenda, oblivious and indifferent. Playing the crowd for tips was consistent. Every band was aware of the vibe of the crowd and the best were reacting and responding to what people wanted. They knew that performance was a two-way street when you’re playing for tips and they kept an open line to the audience. Giving money should be joyful, whether tossed in a tip jar, handed over a shop counter, or tapped into a computer screen. When we’re giving money for discretionary purchases (rather than grudge purchases like council rates or electricity), we feel good. We’re fuelled by anticipation of what’s to come and a sense of achievement for making a smart decision. This is easy to forget when we’re at the other side of the ask. It’s common to feel inhibited or downright anxious about sales. Too often, we seize up when we feel a sales conversation approaching, rather than being graceful, confident and upbeat, in anticipation of the joy we’re about to give. Without exception, I saw no grudge giving in New Orleans. People gave joyfully, knowing they were contributing to the musicians and the lifeblood of the city. Remember this. Regardless of whether you’re giving music, health and vitality, design or life skills. No cash? No worries. A musician with blue lipstick traversed the tables in one wine garden bar with Square, a credit card reader, attached to his phone so that people could tip via plastic. The hustle of being a New Orleans musician never ends. And while this might provoke debates on the need for more support for the arts, that rabbit warren is not the subject of this article. There’s a lot of snobbery in business and, without being vigilant, this can easily become internalised. There’s no shame in marketing yourself. There’s no shame in asking for money. There’s no shame in needing to earn it. And while things do get easier as momentum builds, referrals come, and your competence and confidence grows, the hustle never ends because it’s you in front. It’s your decisions that direct the hustle. Without you leading and hustling, you’re just reacting and responding to other people’s demands, and that’s not why you started your own gig in the first place, yes? 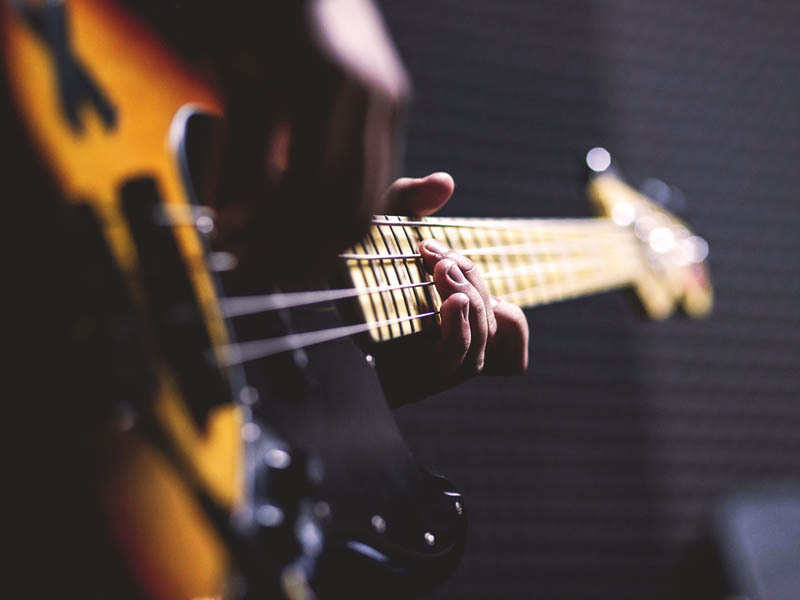 Are you a musician, artist, creative or maker? I’m running a special Sydney course just for you.